Pasta salad is a classic summer recipe, and a must at all potlucks! 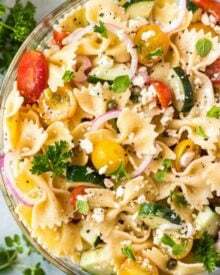 This Mediterranean pasta salad has sweet heirloom cherry tomatoes, crisp cucumbers, mild red onions, salty feta crumbles, briny capers, and is tossed in the most amazing homemade red wine vinegar and herb dressing. Throwing a summer bbq? Try my Potluck Potato Salad, Freezer Pickles, Brown Sugar Baked Beans, Smoked Ribs, or Coffee-Rubbed Burgers. 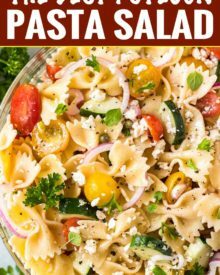 Pasta salads are such an iconic summer food… in fact, at just about every cookout this summer, you’ll probably see a bowl of pasta salad. Everyone loves the complex flavors, and they’re the ultimate thing to BRING to a cookout, because you can make them up ahead of time. That being said, some pasta salads are… well… pretty boring! A handful of shredded cheese, mushy pasta, arbitrary vegetable, and some bottled dressing… sound familiar? I bet it does… we’ve all had it before. 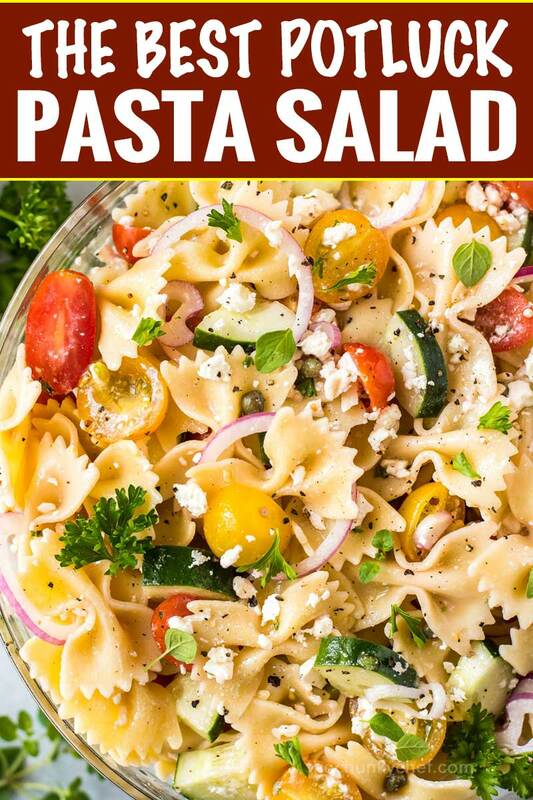 Except pasta salad can actually be amazing when done right! In fact, several readers have emailed me to let me know that this exact recipe won 1st place in a potluck dish contest! Basic pasta salad has 4 main components; pasta, vegetables, cheese/meat, and dressing. 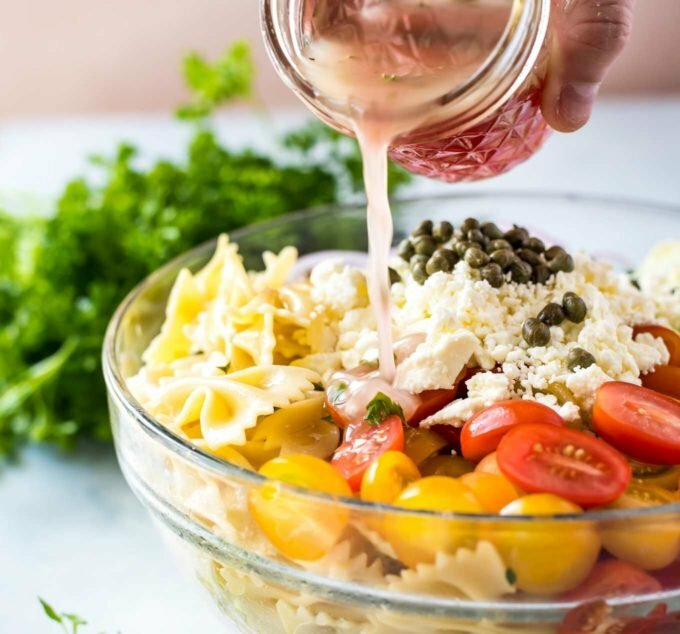 Here are my tips to truly make the best pasta salad ever! I prefer short cut pasta for pasta salad, for ease of eating. 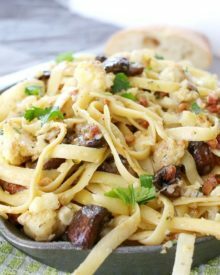 For this recipe I usually go with bowtie pasta or rotini, but any short cut variety will do. I’ve seen pasta salad made with longer pasta noodles, like linguine, but I find it’s harder to serve and eat that way. Vegetables like tomatoes and cucumbers are in season during the summer months, so they’ll likely be fresh and beautiful. I love to add some red onion to the dish as well, to add a sharp savory flavor. If you don’t like the bite of raw red onion, you can soak the red onion slices in cold water for 10-15 minutes, and then drain well. This will tame the flavor considerably. This recipe is a vegetarian one, but you could easily add some sliced pepperoni or salami to bump up the protein. I love to add a bold cheese to really pump up the flavor! Feta, Parmesan, sharp cheddar, etc. I know it may seem like an unnecessary step, since a bottle of Italian dressing is so convenient, but homemade truly is the way to go. Making a dressing takes just minutes, and I promise you, tastes 100x better than anything from a bottle. This dressing is mayo-free, but if you’d like a creamier dressing, whisk in a few tablespoons of mayonnaise! 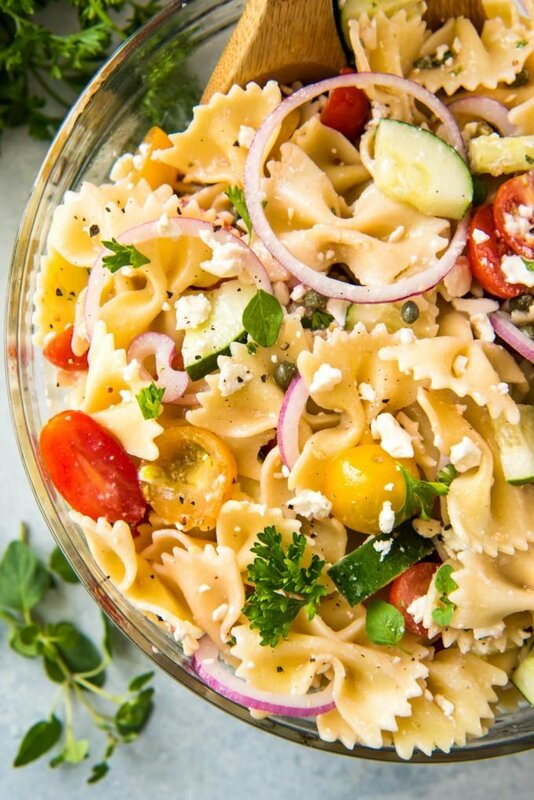 This is the one pasta salad recipe that you NEED. It’s mayo-free so you don’t need to worry about it spoiling out in the heat, and the flavors of that homemade dressing are just insane!! Bright and fresh with slightly sweet undertones, and the awesome punch from both fresh and dried herbs… try it on a traditional salad as well! Pasta salad recipes are the most popular thing to bring to a party or potluck. 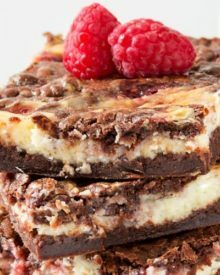 Not only are they always a favorite, they’re also the perfect make-ahead recipe! In fact, this recipe tastes BETTER if made ahead of time. I usually make mine 4-6 hours before eating it, but 1-2 days ahead works just as well. Pro Tip: Make a little extra dressing and toss the made ahead pasta salad with it before serving. It will make the salad taste freshly made and prevent any dryness. Cook the pasta until al dente (according to the package instructions). Mushy pasta makes for a less than desirable salad. The dressing for this pasta salad can also be used as an amazing marinade for chicken or pork! Use whole wheat or tricolor pasta for a fun twist. Any of your favorite veggies can be used. Bell peppers, zucchini, olives, etc. Add some rotisserie chicken to any leftovers for an easy lunch idea! SCROLL DOWN TO CHECK OUT OTHER READERS’ COMMENTS! AND DON’T FORGET, IF YOU’VE MADE THIS RECIPE, LEAVE A COMMENT AND BE SURE TO RATE IT! 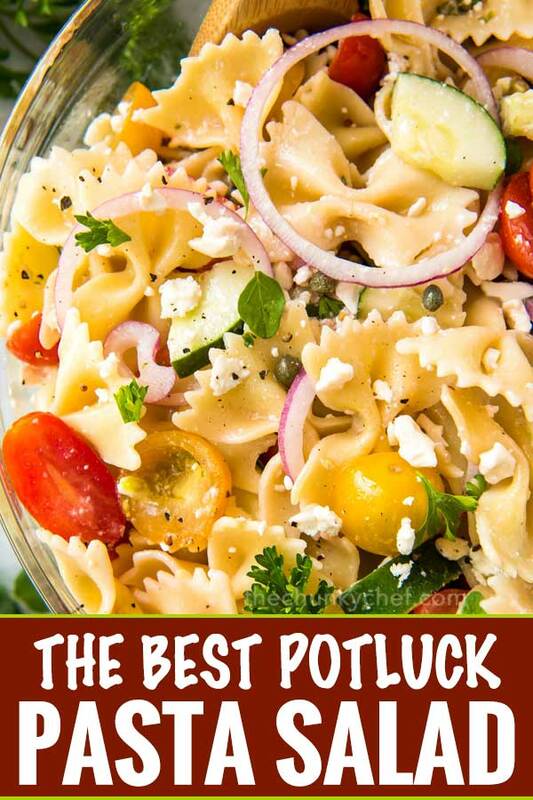 Homemade pasta salad that's perfect for any potluck or backyard bbq! Fill a large stockpot with water and bring to a boil over HIGH heat. Salt the water with about a tablespoon of salt. Add pasta and cook until just al dente (according to package instructions). Drain pasta and toss with a light drizzle of olive oil. Set aside to cool slightly. While pasta is cooling, chop tomatoes, cucumber, and red onion. Set aside in a large mixing bowl and add capers to the bowl. Add dressing ingredients, except for olive oil, to a bowl and whisk to combine. While whisking, slowly pour in the olive oil, and continue whisking until completely combined. Taste and adjust salt and pepper accordingly. Add the cooked pasta and crumbled feta cheese to the large bowl with the vegetables. Pour dressing over the top and toss to combine. Cover bowl with plastic wrap and refrigerate for several hours, up to 2 days. Serve cold or at room temperature, and enjoy! For best flavor, if making more than several hours ahead of time, make extra of the dressing and toss 1/4 cup of the extra dressing with the pasta before serving. This is so picture-perfect! YUM!!! I love this delicious version!!! Looks fabulous! 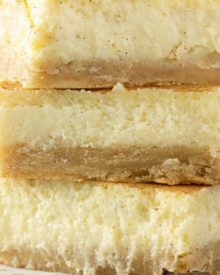 Those combinations of flavors are amazing and so easy to make, looking forward to trying this! My kinda Salad! this looks delicious! Such a great pasta salad!! I love the flavors!! Everyone needs a good, go-to pasta dish. I bet I make a different pasta dish that we eat at dinner and supper every week during the summer. I’ll have to add this to the list! Love pasta salad! I’ve never added bell peppers; that’s a great idea! What a great recipe for pasta salad! This will be perfect for our annual football party! Mmm, this looks delicious! All of the veggies mixed in are a great, flavorful touch. Can’t wait to try this! Thanks so much for sharing the recipe! Thanks so much Morgan! 🙂 I hope you love it! This salad looks like it’s packed full of flavor! I’m making it for our next picnic! Delicious! I am weirdly not a feta fan.. but I would substitute parmesan cheese and dig in!! 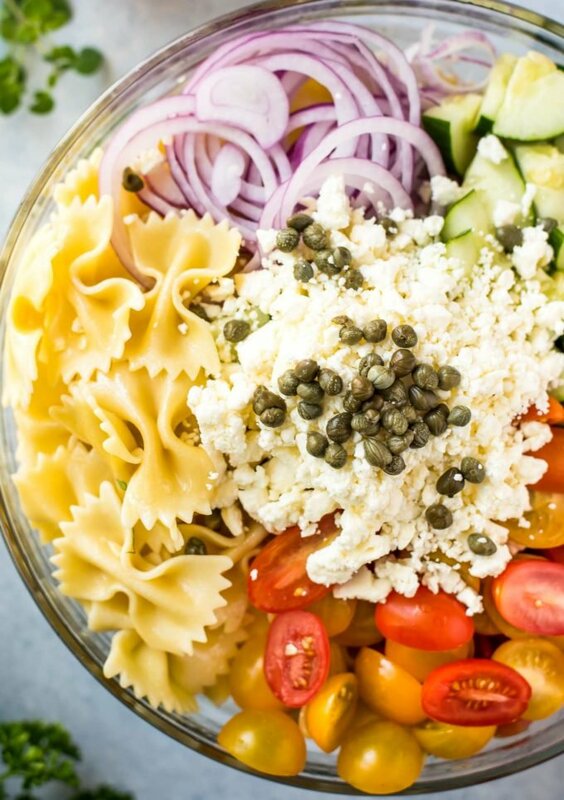 I could eat this Mediterranean Pasta Salad all day! I love salads like this! You can have them with dinner and then you have lunch all week! Microwaved scrambled eggs? 😀 I didn’t know that could even be done! And this looks sooo much better than the typical pasta salad! Totally making this salad this summer! Yum! The colors of this salad are absolutely gorgeous.